"For by your holy Cross..."
I am sure if I asked you if you ever heard of Rollen Stewart, you might scratch your head and say “Who?” If I elaborated on his name, also known as Rock n Roll Rollen, you probably might think he was some rock n roll star from the fifties. If I said “the Rainbow Man”, it might bring you a little closer to his identity. Rollen Stewart was the guy who used to wear a rainbow colored wig at sporting events in the 1970’s and 80’s, and held up a sign that said John 3:16. Stewart would position himself in key areas of sporting venues, whether it was the Super Bowl, the World Series, or the Olympics or golf tournaments. If it was a football game, he would sit behind the goalposts. For baseball or basketball, it was behind the backboard or home plate. It is said that many times he got free tickets from scalpers, television announcers, or he would purchase his own tickets. The television cameras always found him, and you would see him waving his gospel sign in an almost crazy fashion. His mental health later deteriorated, and he was eventually accused of kidnapping, and is now serving a life sentence in jail. The scripture passage he held up should be familiar to all of us: “For God so loved the world that He gave His only begotten Son, that whoever believes in Him should not perish but have eternal life.” The quote is part of a longer passage, in which Jesus is instructing Nicodemus, a religious leader of the Jews, who only comes to Him under the cover of night. Jesus reminds Nicodemus that salvation can be attained only through the cross. We know how important the cross was to St. Francis. We know that it was Jesus, speaking to Francis from the San Damiano Crucifix, that marked a turning point in his path to God and process of conversion. All through his life, Francis exemplified his love for the cross and what it stood for- the great love that God has for us, and the sacrifice of His Son Jesus Christ. This month of September should be a great reminder of the importance of the cross in our own lives. On September 14, we celebrate the feast of the Triumph of the Cross, and on September 17, we Franciscans celebrate the Feast of the Stigmata of St. Francis. What an honor for us as a province that during this month we celebrate several important events in the life of our Province. On September 8, the Feast of the Birth of Mary, our three novices were invested with the habit of St. Francis and began their novitiate at the Sanctuary of San Damiano in Assisi, in the very chapel and at the very place made holy by our Holy Father St. Francis many years ago. On September 16, we gathered at Mt. Alvernia in Wappingers Falls to mark the fiftieth anniversary of the Retreat Center and the tremendous ministry taking place there over these years. The next day, September 17, two candidates were received into the provincial postulant program in Canada. 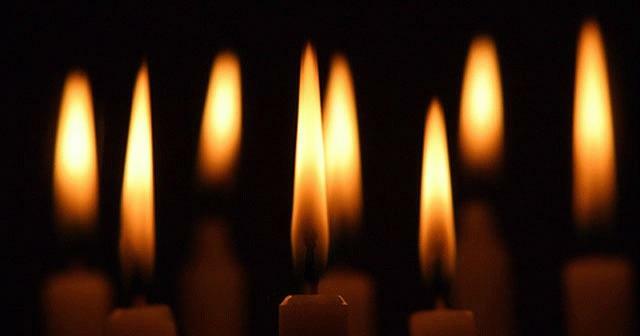 So, we congratulate our new novices, Friars Daniel, Jack, and Carl, as well as our new postulants Dmitry and Hawkins, and we wish them great spiritual and personal growth in this next step in their initial formation. 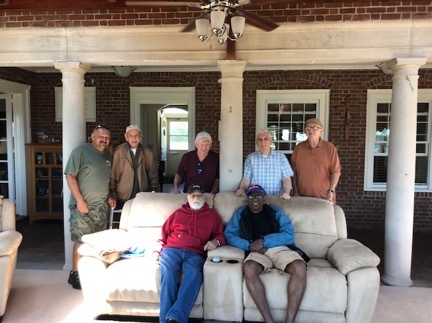 We also congratulate Friars Tom and Francis for building on the legacy of so many who have served at Mt.Alvernia Retreat Center. And we encourage all our friars to keep their eyes set always on the Holy Cross. In celebrating Mass on September 17 at LaVerna in Italy on the Feast of the Stigmata of our Holy Father St. Francis, Friar Michael Perry, OFM, our Minister General, reminded all of us in his homily "We make the climb to LaVerna because we want to touch Christ's wounds." May we all touch Christ's wounds and incorporate them into our hearts and lives, for at the heart of the cross is God’s love for us- a love that is without limit and without boundary. Give me right faith, sure hope, and perfect charity. that I may fulfill your command. With blessings and peace . We are filled with joyful anticipation as we count down the final days before our reception into the Novitate at San Damiano in Assisi. We returned to Convento San Francesco in Rome on Wednesday, August 22nd and began to make final preparations before our journey in Assisi. We participated in the pre-novitiate retreat at the Convento San Francesco del Monteripido in Perugia, along with the Postulants of the Assisi province who will enter the Novitiate with us. Each day included Mass, Morning and Evening Prayer, a class in the morning and afternoon, and plenty of time for silent prayer. The morning class was given by Sr. Rosa of the Franciscan Missionary Sisters of the Baby Jesus, and centered on discovering who Jesus is in our lives and how we can become better disciples of Him. Sr. Rosa used two scenes from the Gospel according to Mark during each lesson to guide us in our prayer each day. 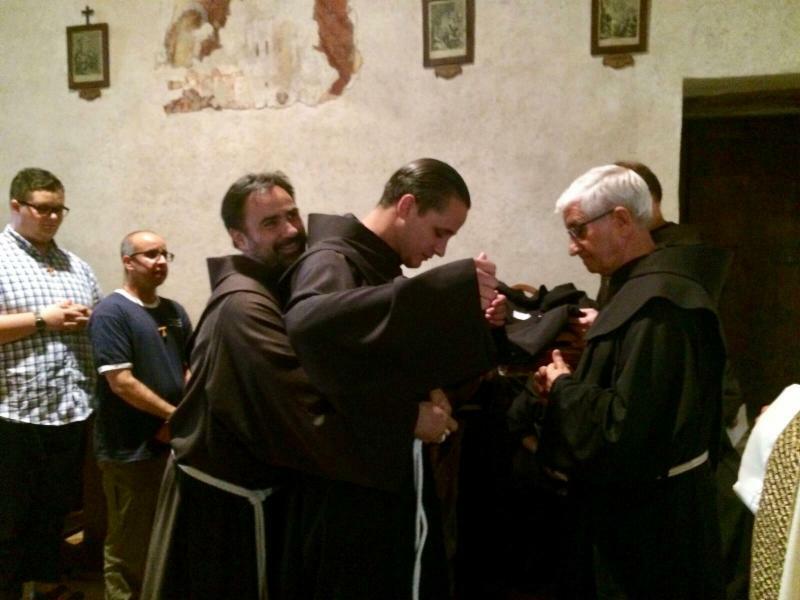 On two occasions this week, the Provincial Minister of the Seraphic Province of St. Francis of Assisi, Fr. Claudio Durighetto, gave a talk about what the Novitiate is about. He spoke about it being the “year of the test,” a year so we can continue to discern our vocations in an even more intense way. He also gave us a background on the history of the imposition of a Novitiate year on St. Francis by Pope Honorius III in the year 1220. Finally, he urged us to “leave our fears behind and be full of joy” as we walk this journey. In all, the week was truly, restful,fruitful, and edifying as we get ready to enter the year of the test. To close out the week, we were blessed with the opportunity to witness the renewal of temporary vows of eleven Friars on Saturday, September 1st, as well as the First Profession of two Friars who finished their Novitate at San Damiano on Sunday. For the week leading up to the Reception, the three of us went to separate Friaries to continue practicing speaking Italian. Jack remains at Monteripido, Dan is staying at Santa Maria della Spineta, and Carl is staying with the temporarily professed friars in Farneto. We want to say how extremely grateful we are to the Friars of this Province, who have been so hospitable to us in these couple of weeks. Please continue to pray for us as we begin to discern even more closely our vocations. You are all in our prayers as well. We hope, with the permission of our Novice Master, to continue to keep everyone updated periodically on our experience in the Novitiate. Pace e bene a voi! 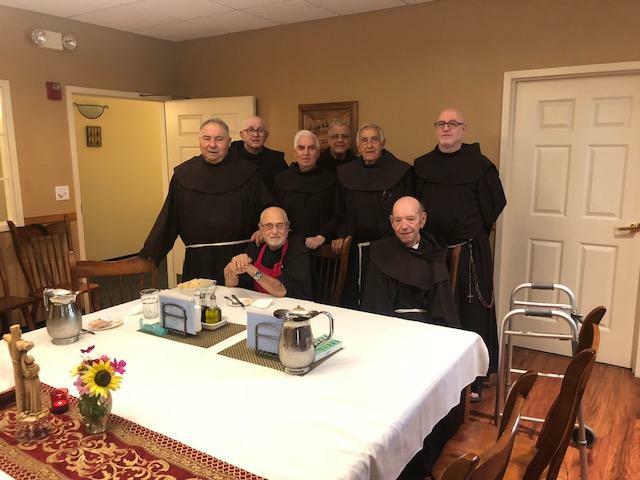 On the eighth of September, at 4pm, Novices Jack Sidoti, Daniel Cavalieri, and Carl Green, along with five Italian novices, received the habit of St. Francis in the Santuario di San Damiano, thus beginning the Novitiate year. The Rite was celebrated by Fr. Claudio Durighetto, Provincial Minister of the Assisi Province. The Ceremony began with the Provincial welcoming the province of the Immaculate Conception, and then followed with the novices asking the Provincial to be vested with the Habit and to begin the novitiate year. Three readings were then proclaimed from the scriptures and from Thomas of Celano, with the common theme of leaving the secular life behind and accepting this new life in Christ, clothed in the Habit of St. Francis. After the Homily, the investiture took place. The Italian Novices were vested by the provincial, and the Novices of IC Province were vested by Fr. Antonio Riccio, provincial delegate. 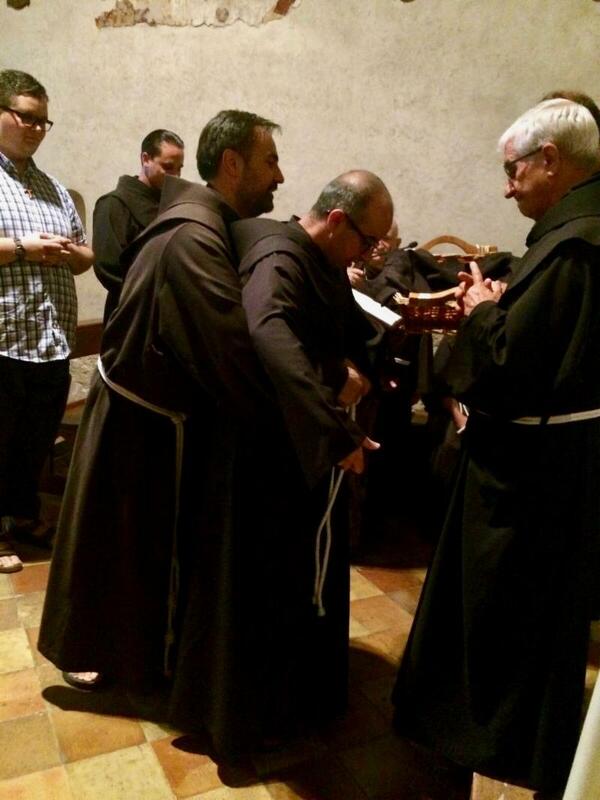 The new friars then venerated the San Damiano Crucifix, and embraced the friars. Then, as a symbol of the transition from the congregation to the fraternity, the novices left the pews, and took their places in the choir amongst the community. In all, it was a day full of emotions for each one of us. We could all feel the presence of the Lord affirming us, loving us, and calling us deeper into our vocations. The day was filled with the joy of the Lord and the warm embrace of fraternity. It truly was an overwhelming day to remember. As we continue on this cammino with Christ, please continue to pray for us. Our three postulants prepare to be received into the novitiate. Friar Carl Green, O.F.M . 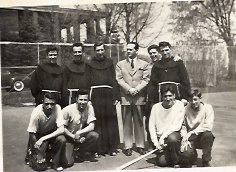 Friar Jack Sidoti, O.F.M . 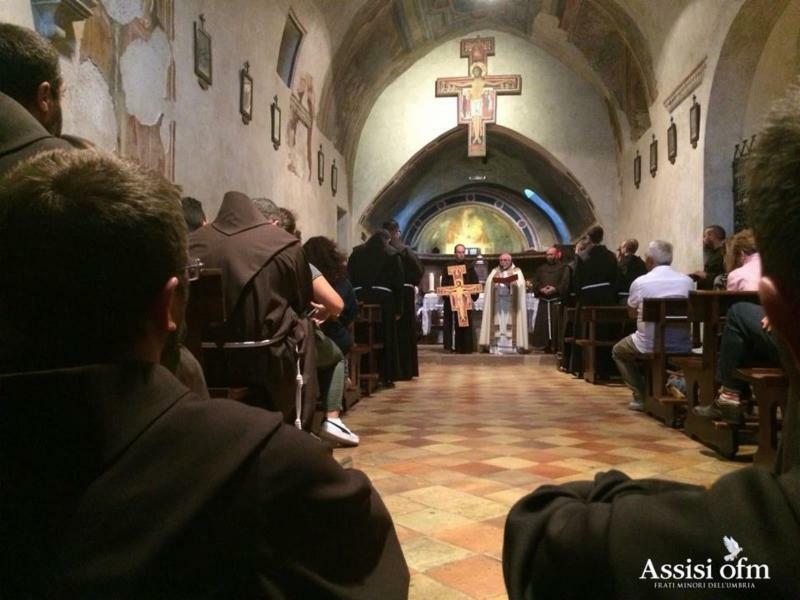 Franciscan habits await new novices. Novices welcomed into the fraternity. 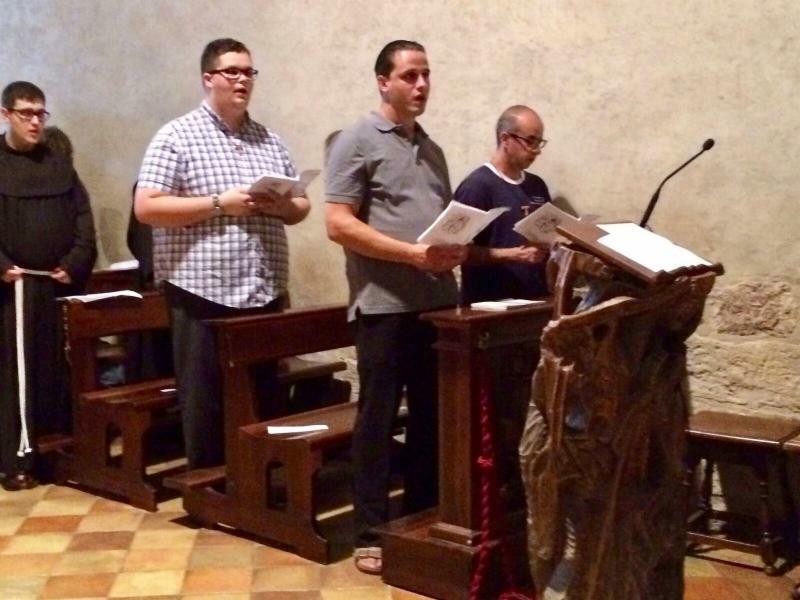 We received this article from Friar Pierre Farrugia, OFM, Director of Postulants. Greetings to all the brothers! Just a little something about what’s happening here regarding Postulancy as quite a number of friars have asked. Our Postulancy program in Caledon began on Tuesday, September 4 th . 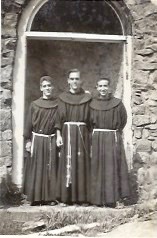 The friars on the formation team at this house are Peter Furgiuele O.F.M., and myself, Pierre Farrugia O.F.M. We were happy to receive our two new postulants, Dmitry and Hawkins who have been with us now less than two weeks from the date that I am conveying this update to you. From the onset let me just thank all the friars who thus far have helped these two gentlemen arrive at the doors of their initial formation. We thank our Provincial, Robert Campagna O.F.M., and the Definitors, the Secretary of Formation, Ronald Gliatta O.F.M. 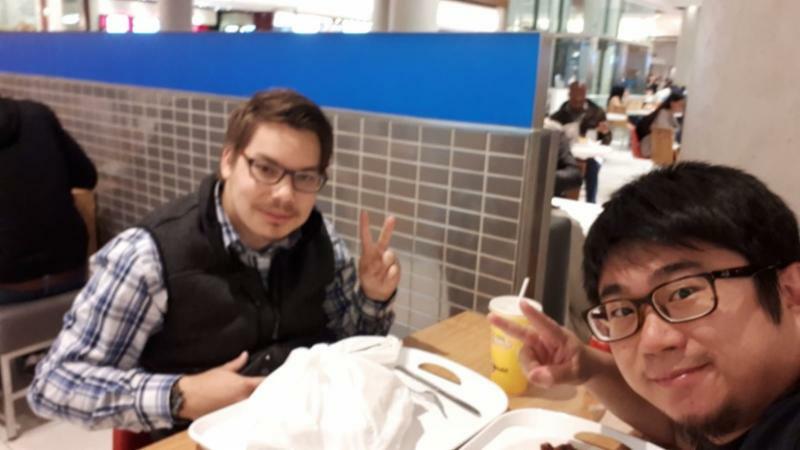 and also Bruce Czapla O.F.M., and our Vocation Animator, Conrad Fernandes O.F.M., for all their great work in accompanying these two young men to this point and the continued support they show them. They have both said how helpful all the friars they have encountered thus far have been to their journey. Looking forward we thank also all the friars, especially those here in the Canadian Foundation, who in some way will contribute to the Postulancy Program. 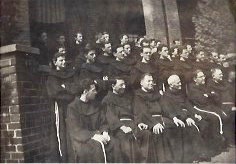 As the Ratio stipulates, all the friars in a province are called to be formators and to help with forming those in initial formation. Upon their arrival, we immediately began with an evening of prayer and reflection at the Centre with our normally scheduled “First Tuesdays of the Month Holy Hour” where we have an hour adoration of prayer for vocations and then follow it up with a spiritual lesson of sorts. The last couple of years have been a Marian Bible Study and The Catholicism Series by Bishop Robert Barron. Hawkins and Dmitry joined in and got to meet many of those people who had and are still praying for them. The people were thrilled to meet them. The very next day they began their “Beginning of Postulancy Retreat” at the Martyr’s Shrine up in Midland. It was a fruitful encounter for the both of them and they came back with a lot of enthusiasm and excitement. At the friary in Caledon, we have two different daily schedules: one when we have groups we receive at the Centre, and one when we do not. We have a Saturday and Sunday schedule as well with Sunday being their free day. We begin every day with 7:45 morning prayer followed by Holy Mass. Then, if a group is at the centre, we head over to be there to lend a hand of hospitality and aid the staff in their work load for that meal by cleaning up afterwards and setting up for the next meal. The postulants are able to engage the many different types of groups which visit us and also enjoy helping serve the meals. After breakfast every day, whether at the friary or at the centre, Peter gives them Italian lessons. This is to help them ease into their novitiate year in Italy, and also God-willing as an asset for their future pastoral ministries. Aside from English, as you know, Italian or Spanish are two languages the Order prescribes knowing (either one or the other) for pastoral work in multi-ethnic communities or to cultures predominantly speaking those languages. Each member of the fraternity here takes their turns cooking for the others. The postulants cook together on Wednesdays and Saturdays while Peter cooks on Thursdays and I cook every Monday, Tuesday and Friday. I have to say, we are not doing too bad at all at the cooking! We’ve included some photos. Then after lunch, on Tuesdays and Thursdays at 3 or 4pm depending on our calendars, I sit with the guys for lessons of various sorts which cover what’s prescribed by the Ratio. We’ve started with the Liturgy of the Hours and Francis’ Style of Prayer as distinguished from other forms of prayer within consecrated life. Soon we will begin going through the Catechism together, and then closer to the end of postulancy, Franciscan Spirituality – just the basics. Aside from what Peter and I are doing with them at the friary regarding these lessons, we also will be taking them to various friars on a monthly basis for everything else the Ratio is asking for. 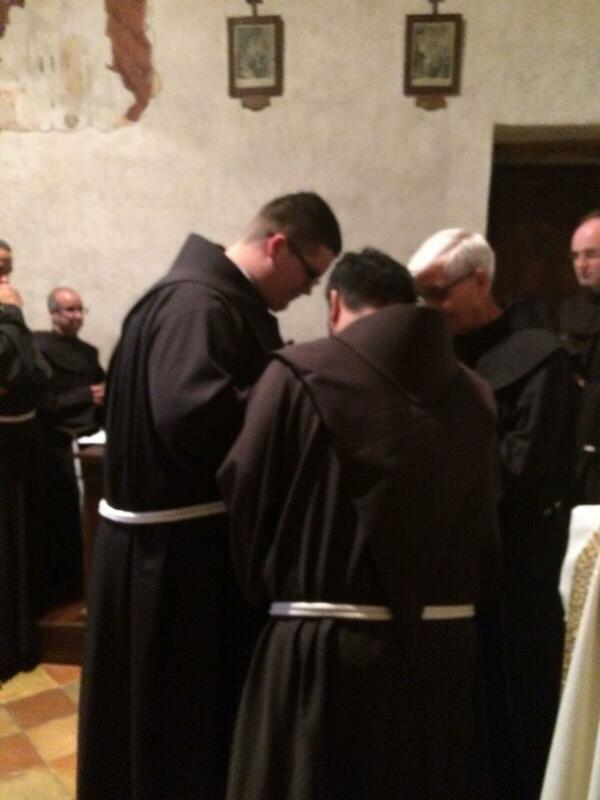 We thank all these friars for their generous commitment to help in this regard as I mentioned above. Aside from the work at the Centre, the other apostolate we will all be engaged in together will be a soup kitchen in Brampton (45mins South of us) called Knight’s Table, originally begun by the Knights of Columbus. Their the postulants will have a better idea of the realities of the less fortunate whom we minister to with special devotion and attention as part of our charism. We will be doing this twice a month for now. Our main meal each day is lunch, and at breakfast and dinner everyone helps themselves with what they want and if there is a group at the centre, we eat with the staff who very warmly received our Postulants. We pray vespers everyday at 5pm, and on Mondays, Thursdays and Saturdays we pray the Rosary together as a fraternity. If we have no groups at the centre, Saturday is a clean up day at the friary. All of us are assigned our particular tasks and it gets done. Sunday is a free day for them where they are encouraged to unwind in a healthy manner by visiting friends or family or by merely spending a day out in Toronto for example. The guys are getting used to the Divine Office and everything else for that matter slowly but surely, and as you know, the first year is always a delicate year. For this reason I ask you to keep them both in your prayers and do not hesitate to drop them a line. They are both very wonderful young men! Please also keep Peter and myself in your prayers because this is also our first year in formation ministry. We send greetings to you all, and many blessings from above. Hi my name is Dmitry Neill . I am 20 years old. I was born in East Siberia, Russia and I was adopted at age 7 or 8 and came to America with my new family and since then I have lived in America for 12 years. 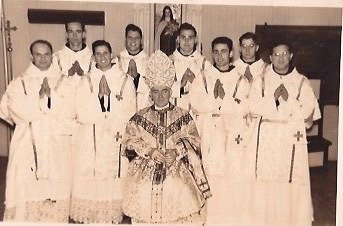 Since my time in America, as a young boy, I felt the call to priesthood after going to mass a few times with my new family and when we got back home I would pretend to be a priest. Later on in my life, once I got to my senior year of high school, I started to participate more in church activities like youth groups and going on Steubenville East retreats. Once I graduated I became a catechist and taught third grade First Holy Communion and ninth grade Confirmation. I also became a member of youth ministry as an adult leader and a knight in the Knights of Columbus and now I am a postulant in the Order of Friars Minor in Caledon, Ontario, Canada. (Note: Dmitry is from the parish St. Francis Xavier in New Milford, CT and is well known by many of the friars who served there). My name is Hawkins Choi and I was born in Hong Kong on December 10, 1985. I am a carpenter. The year of my baptism was 1987. I like to read, listen to classical music and Adoration. I enjoy Eucharistic Adoration the most. I like to spend time with God without thinking or doing anything, and simply be in the Eucharist's presence. On the other hand, I can be a very active person where I enjoy group events. I enjoy sports, as I used to play badminton with a group of friends. I also enjoy nature, where I can just marvel at God’s work. I actually love to pray for people and walking around the street praying for people and finding God in each of them is something I enjoy too. I was a committee member of our parish's youth group “YOSAC”, Youth of St. Agnes Church. As part of YOSAC, there is an important annual retreat for about 50 youth, hosted every Victoria Day long weekend. In 2014, our speaker was Fr. Conrad, OFM. 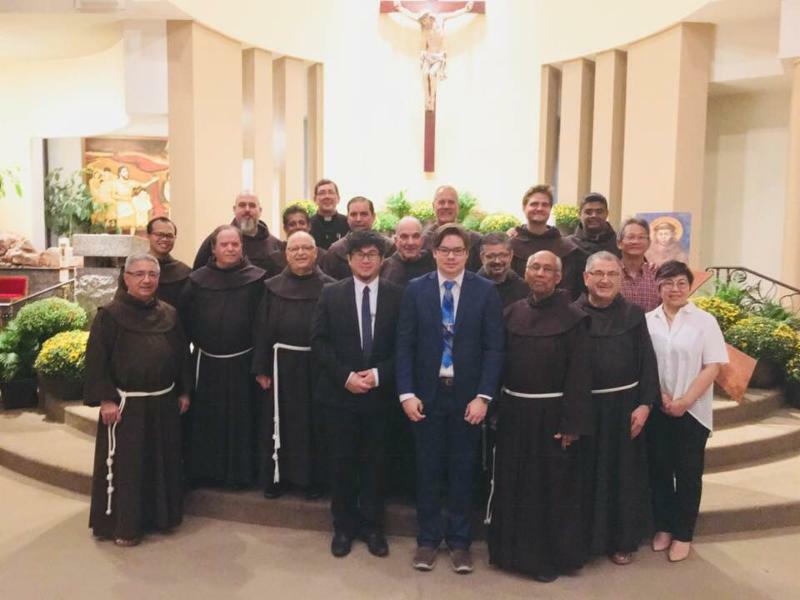 It was at this annual YOSAC retreat where began to learn a little about the Franciscans and St. Francis of Assisi. I went to my first “Come and See” in 2015. After two year of discernment, and before I was about to take action on His calling, my spiritual director suggested for me to see more congregations before I apply to any, so I found Fr. Conrad and he told me he had become the vocations director in the province, awesome. In later on, I found something different when I went to OFM - “Come and See”. I felt like home.” It wasn’t just that house that felt like home, but all the houses I went to later on, all the friars I met gave me the sense of family. And this is where I am now, as the first year of Postulancy begins. I am looking forward to learn more about the Franciscan spirituality and be one in the future. 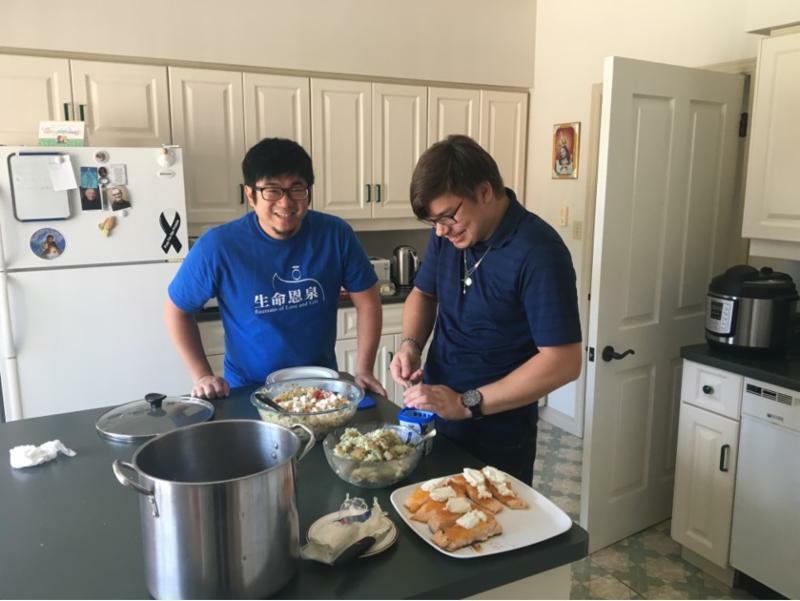 Postulants Dmitry Neill (left) and Hawkins Choi getting to know each other and taking their turn cooking. September 17 reception of Hawkins and Dmitry into the Postulancy program with the reception of the Tau Cross. Congratulations, brothers. September 17 reception- Postulants and Formation Team. Friars enjoying fraternity- and goodies! Catskill Celebrates "Cat'n Around Catskill"
This year the Village of Catskill NY celebrated the twelfth year of “Cat’n Around Catskill" on historic Main Street. The street was again lined with exciting artist renditions of various felines, thanks to the commitment and support of generous sponsors. The large fiberglass images are created by various artists in front of the many stores and restaurants on Main Street. Some of the businesses in Catskill actually have their own artists submit photos which are then created for the event. These works of art were on display from Memorial Day to mid-September. On September 22 at the Catskill Point, the cats were auctioned off at a gala fundraising event. The project is sponsored by the “Heart of Catskill Association”, a civic organization promoting Catskill. It is done to promote tourism and interest in the village. The village also sponsors fireworks displays on the Hudson River. The fireworks are launched from the ballfield on our St. Anthony Friary property, so the friars get an upfront view of the display. 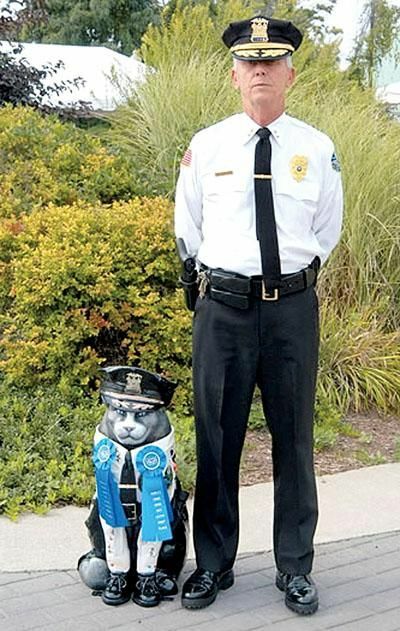 Catskill Police Chief David Darling, a good friend of the friars, poses with his "alter ego" Catskill cat. The Friars at St. Anthony Friary get an close view of the pyrotechnics show shot off from the friary ballfield marking special events for the Village of Catskill. 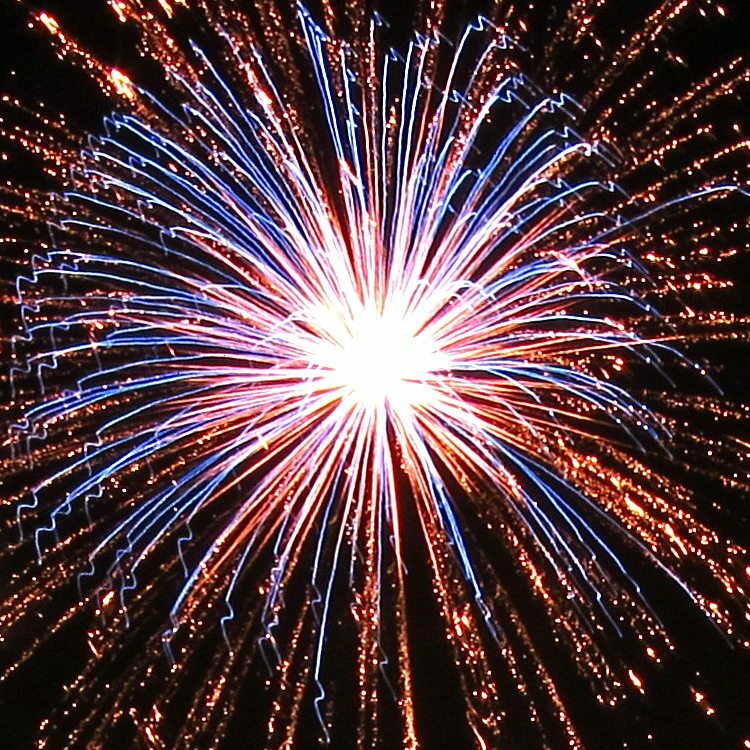 Father Albin, who has seen many fireworks displays, said that this year's September 9 display was the best ever. 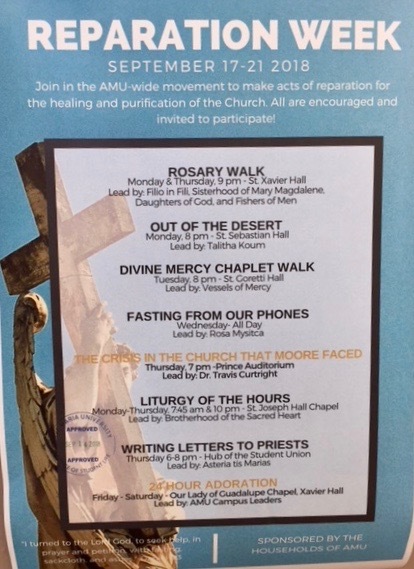 From September 17 to 21, Ave Maria University will be holding a “Reparation Week”, to encourage acts of reparation for the healing and purification of the Church during these difficult times. All have been encouraged to participate. Reparation Week will consist of various activities, talks, and prayers, including a Rosary Walk, an all-day fasting from phones, writing letters to priests, and 24 hour Eucharistic Adoration. 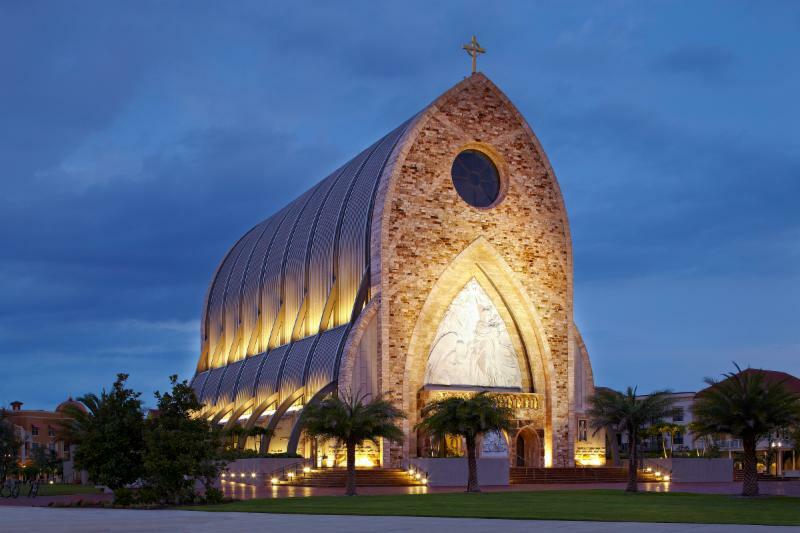 Our own Friar Rick Martignetti, OFM is the Director of Campus Ministry at Ave Maria. The Campus Ministry facilitates spiritual life on campus and is at the core of the University’s Catholic Identity. It supports the sacramental life of the student body, faculty, and staff, to “establish and nurture a living relationship with Christ, our hope.” Such activities as seven weekend and five daily masses, confessions, spiritual direction, perpetual adoration, devotions, and spiritual education and catechesis marks the school as a truly “Catholic” university. The University is located in Ave Maria, FL, a planned town in Collier County in Southwest Florida, about 50 miles from Naples. It has been a hot summer in Boston. 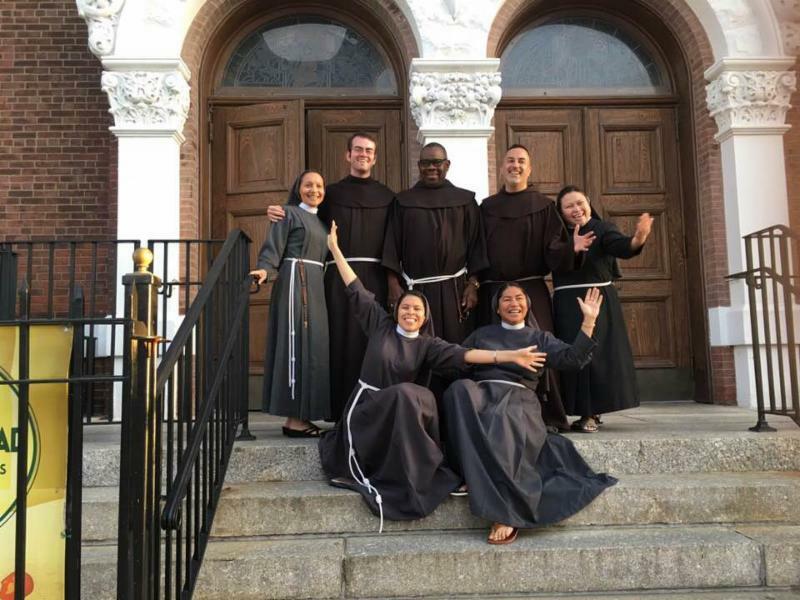 As the weather begins to change the friars of St. Christopher Friary Boston look back on some of the season’s events. On Memorial Day, the friars ventured out to Fenway Park to watch the Sox beat the Blue Jays 8-3. Bishop Maurus took personal responsibility for the win with his fine ”from the stands” coaching. Aubert refrained from the Cracker Jacks. 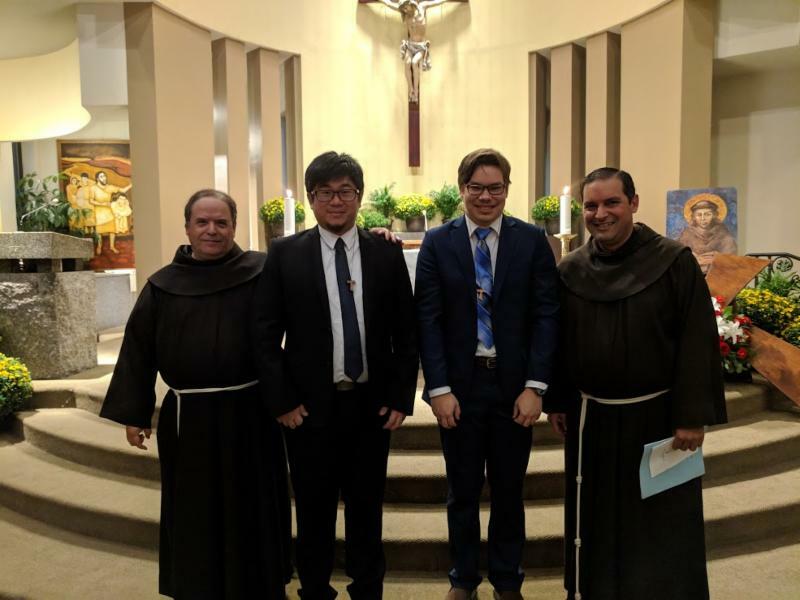 Two new members came to the friary in June, John Bavaro who moved to us from St. Anthony in Catskill, and Joe Nathan, of the Singapore Province, transferred from St. Anthony, NYC. Joe is helping out at St. Leonard’s Parish. 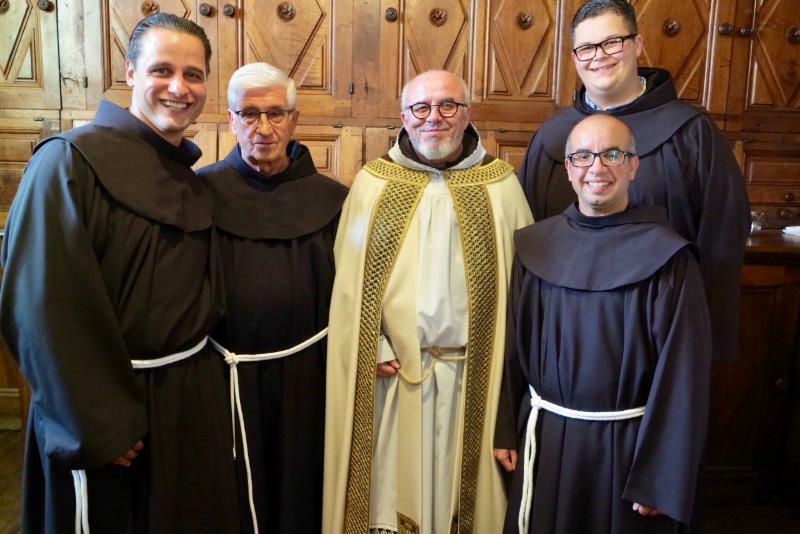 On July 11 the friars joined in a gaudeamus to welcome our new brothers and to welcome home Gabriel Aceto, who spent three months in Rome with the postulants of the Province. 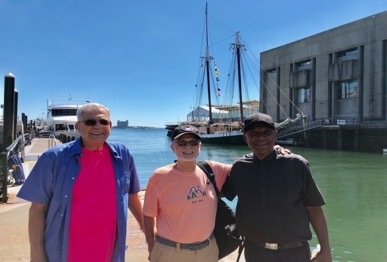 On July 11 the guys were off for a day trip to St. Joseph’s, Buzzard’s Bay. 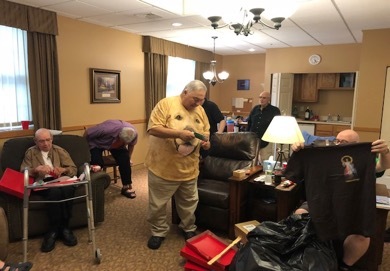 On the 25 th brothers celebrated “Christmas in July” which included prayers, songs, and inspired gifts. Giles Barreda came to be with us for the event. The caroling left something to be desired, but a jolly good time was had by all. Among many visitors this summer were, Friars Cesare Viani (Italy), OFM Secretary of Formation (Italy) and Siniša Balajić (Croatia) Assistant Secretary,who joined the community for a few days prior to the Formation Congress in Wappingers Falls; Carlos Martinez of Honduras, a friend of Maurus; and Msgr. Byron Cevennes, of the diocese of Juticalpa, who joined the community for three weeks as he served on mission appeals in the Boston area. Trying to keep the friars home or on land in the summer just doesn’t work. The brothers ventured out for a harbor cruise and dinner to celebrate the Portiuncula on Aug. 2. 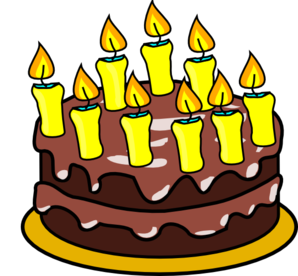 It was hard to get the friars to celebrate the concept of a “little portion”, a relative term on this day. Anniversaries were remembered on Aug. 16 th . James Welch celebrated 25 years of profession and other members celebrated over 60 years. As the summer wrapped up, a celebratory clambake took place on Labor Day to get ready for the coming autumn season. 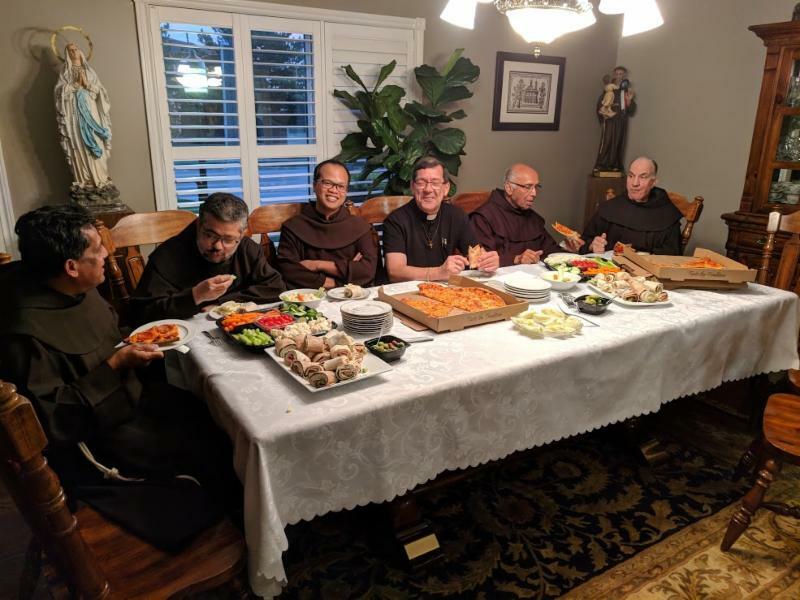 Not only focusing on social events, the friars have reviewed the document Redemptoris Sacramentum and discussed it in light of the community liturgy. 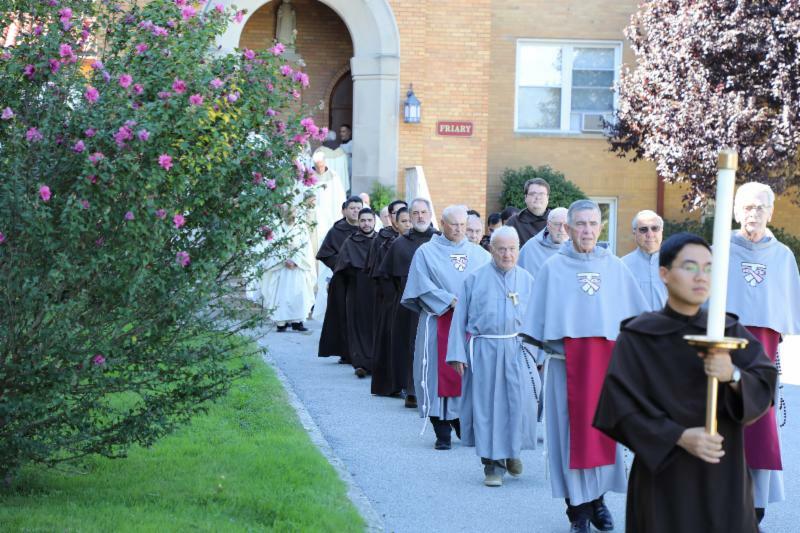 The friars will begin autumn early with their monthly Day of Recollection in September. The house chapter theme for September is still being determined, but topic formulation and preparatory materials are being readied. Each month the community selects a petition to pray for during the month. In August they chose to focus on prayers for Iraq, Iran, and the Middle East. The September petition focuses on concern for fire fighters, police officers, and other emergency personnel and first responders. While keeping all of the petitions from the Province in prayer, the brothers welcome other prayer requests from the friars of the Province. 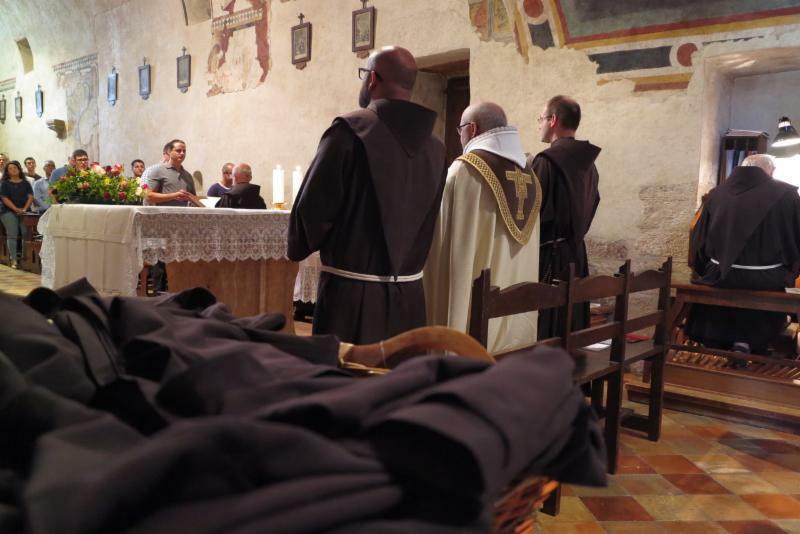 In their spare time, three of the friars have begun online First Aid, CPR, and AED training. Although Labor Day and cooler weather usually signals the end of the feast cycle in the North End, flyers are proclaiming that San Gennaro is coming to the Boston in September! So, the fall holds many more interesting experiences. Roland unwraps gift as John and James try on their new tee shirts. Is Robert doing his exercises? Robert, Aubert, and Byron prepare for their voyage. 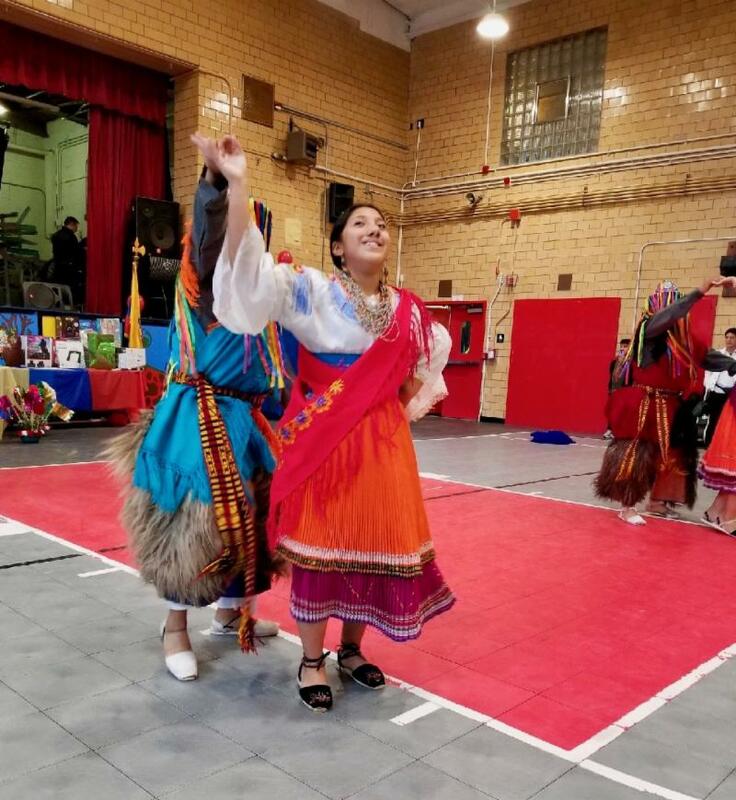 On the weekend of September 7-9, the friars and parishioners of Our Lady of Peace Church in Brooklyn, NY celebrated the feast of Our Lady of Rocio (Vergen del Rocio- Our Lady of the Mist), an Ecuadorian feast of the Blessed Virgin Mary. The festivities began on Friday, with the praying of the rosary and serenading the Virgin with Marian songs of Ecuador. 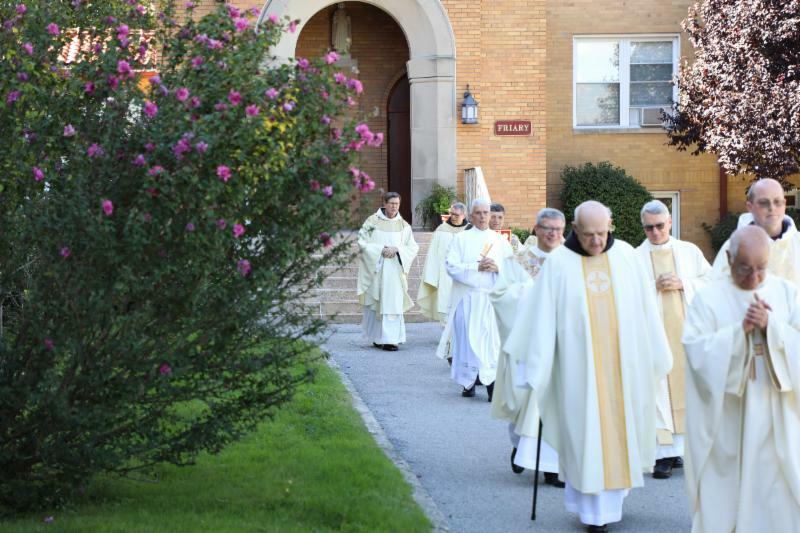 Mass was celebrated on Sunday, September 9, followed by a street procession. 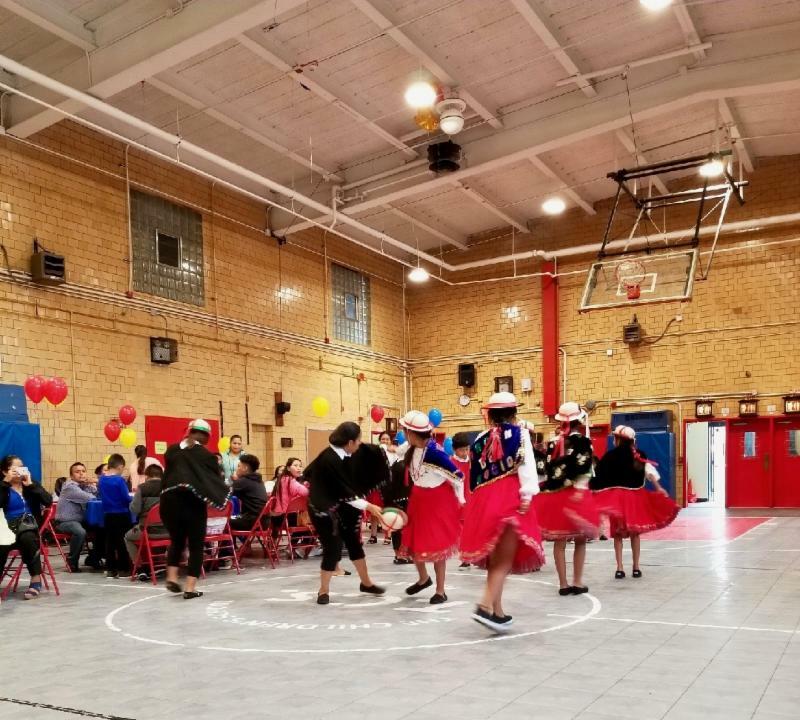 The community gathered in the recreation center with festive dance and entertainment typical of Ecuador, with many people dressed in festive garb. Almost 300 people attended the celebration. 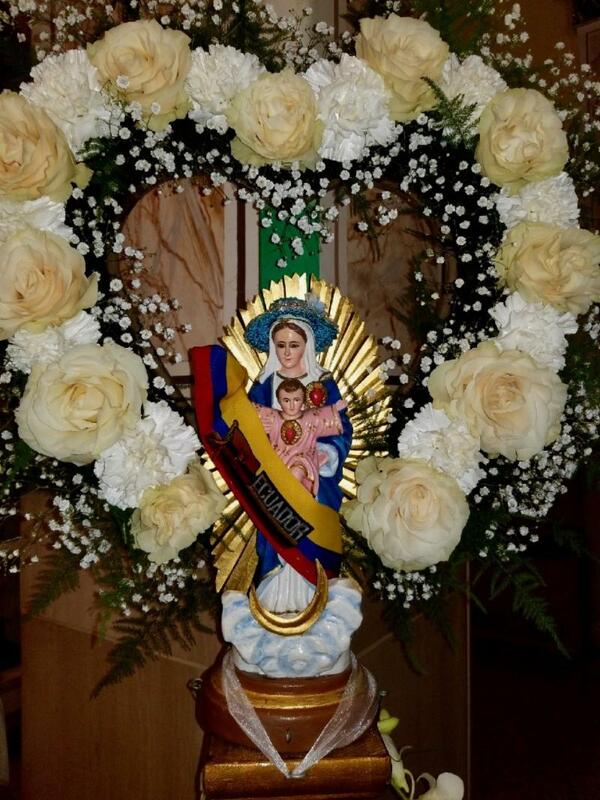 The celebration of Our Lady of the Rocio (Our Lady of the Mist) originates back to the late 19 th century, to the area of Biblian, Ecuador, when a terrible drought afflicted the land. The local people turned to their parish priest, who led them in procession, accompanied by a statue of Blessed Virgin and Child, to a place that he had seen in a dream. They stopped at the place about 1000 feet above the town. He placed the statue there and the priest led the congregation with prayers for rain. The next morning they found the surrounding fields covered with dew. From that time rain became plentiful and crops flourished. The people called Our Lady “Our Lady of the Mist (or Dew)”, and a magnificent basilica was built there into the side of the mountain. Devotion to Our Lady of El Rocio actually originates in 17 th century Spain, and through the years, was adopted by the people of Ecuador. Thousands visit the basilica each year. 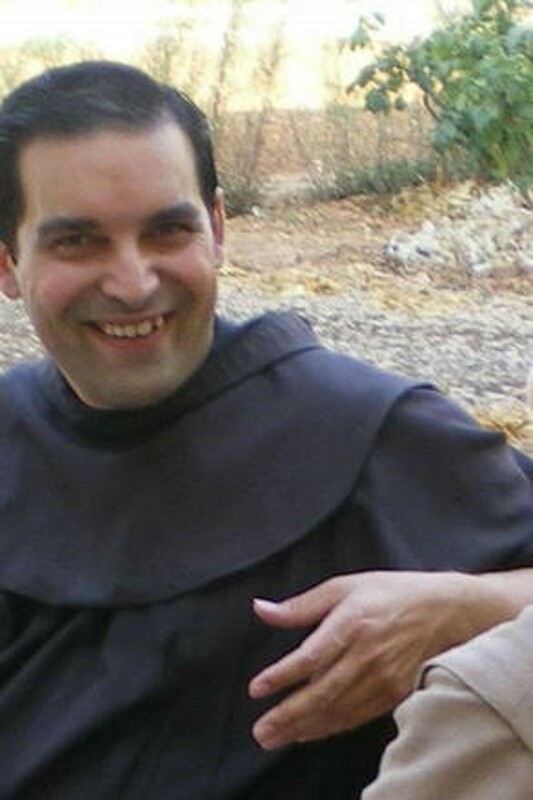 Friar Orlando Ruiz, OFM is the pastor of Our Lady of Peace, and is assisted by Friar Courtland Campbell, OFM. The National Catholic Register in its travel section of September 8, 2018, had the following article about our own St. Leonard of Port Maurice Church in the North End of Boston, written by Joseph Pronechen. Boston’s Freedom Trail, which includes Paul Revere’s House in the city’s historic North End, traces the early days of the American Revolution and the origins of the United States. What many people do not realize is that one of Boston’s most beautiful churches — St. Leonard of Port Maurice — is a two-minute walk away. The Freedom Trail from the house of the Revolution’s most famous silversmith takes a quick turn back to Hanover Street, where St. Leonard’s stands on the opposite corner, with its façade facing Prince Street. 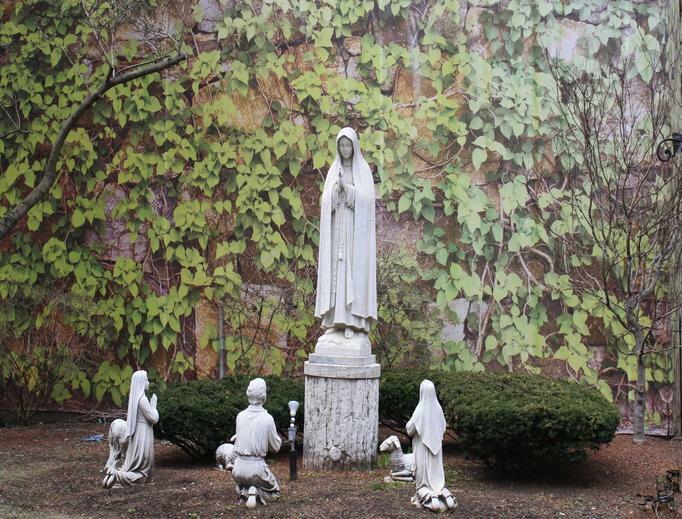 The church’s garden, on Hanover, is dotted with statues honoring the Virgin Mary’s appearance to the children at Fatima on one side and the Sacred Heart and St. Anthony with little children on the other side. There is a high wall of flourishing green vines behind the Our Lady of Fatima statue; even close up the vines look real, yet the greenery is painted in trompe l’oeil style. Visitors and pilgrims are drawn along the garden’s walkway to the church’s side doors, which act as the main entrance into the first Catholic church built in New England by Italian immigrants. The year was 1873. 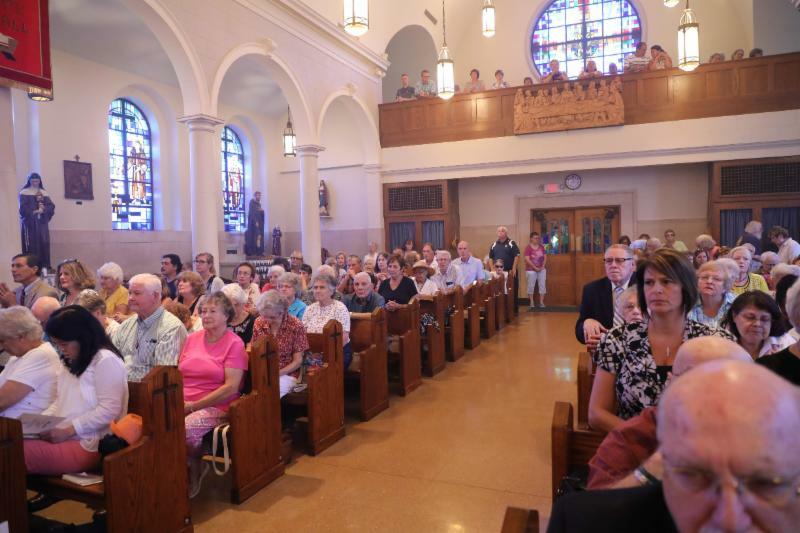 It’s also the third-oldest Italian-American parish in the country. The Romanesque Revival style is evident in the arches from the nave to the side-altar Shrines of the Sacred Heart and the Blessed Mother, to both the nave and clerestory windows, and even the Stations of the Cross. All have been meticulously restored. On Dec. 17, 2017, the church was reopened with Boston Cardinal Sean O’Malley celebrating Mass. It had been closed for nearly a year for the restoration. The mural filling the apse draws eyes upward. The scene depicts Mary’s assumption, showing an image of the Blessed Mother on a cloud, escorted by a court of angels and cherubs. The images of haloed apostles in various poses of reverence and awe are beside the empty, flower-filled tomb. Our Lady is also honored in two smaller murals framed by lunette-like arches above the side shrine. One shows the Holy Spirit descending on her at Pentecost; the other shows her coronation by God the Father and Jesus. 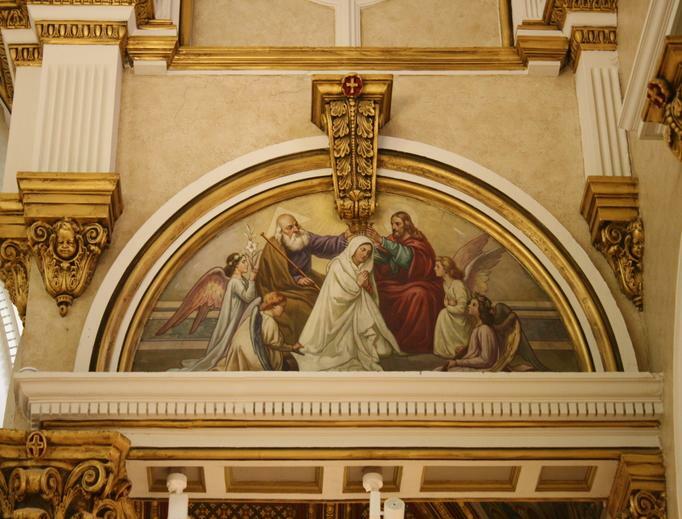 The recently restored Old Master’s-style Assumption mural was completed around 1943, likely for one of the church’s anniversaries, the pastor, Franciscan Father Antonio Nardoianni of the Order of Friars Minor, says. The pastor is not the first Franciscan to have shepherded this church. In 1873, the bishop of Boston — Archbishop John Joseph Williams, the first archbishop of the Boston Archdiocese — put the Franciscans in charge of taking care of this church and the spiritual needs of the people, and they have been here ever since, for the last 145 years. The church itself was first finished and dedicated in 1899. Before that, the parishioners worshipped in the completed lower level. Father Nardoianni said his aim for the restoration was for the church to be returned to its original style. That included bringing up and restoring the original marble altar, which had been in the downstairs St. Anthony Shrine. ﻿Some replacements were also needed. Out went the carpeting and in came white tile flooring. The new pews, custom made of cherrywood, are in keeping with the Romanesque style. Stained-glass windows were returned to their original beauty, from soft pastel-like designs in the nave windows to the vibrant colors of the windows of the Sacred Heart, Blessed Mother, angels and saints in the upper clerestory rows. A litany of saint portrayals abounds in the church’s paintings and statuary. Most are original, but some have been added, like that of St. Padre Pio, who stands by fellow Franciscans Francis, Anthony of Padua, and Leonard, the church’s namesake. Lining the nave, St. Joseph and Our Lady of Grace are accompanied by such saints as Thérèse, Maria Goretti, Lucy, Peregrine, Jude, and Patrick, the Boston Archdiocese’s patron. Below the Assumption mural in the sanctuary, other saint images, framed in individual Roman arches, line the apse. Among them are Joseph, Bernadine of Siena, Clare, Bonaventure, Elizabeth of Hungary and, in the center, Leonard of Port Maurice, whose feast is celebrated Nov. 26. His name comes from where he was born in 1676, Porto Maurizio, Italy. Leonard had a reputation as a remarkable preacher, giving missions in many places; thousands at a time would come to hear him, prompting countless conversions. Besides his devotion to spreading the Stations of the Cross, Leonard also promoted devotion to the Sacred Heart, the Immaculate Conception and the Blessed Sacrament. “He prompted the devotion to adoration,” said Father Nardoianni. The spirituality of its patron saint led the church leadership to make the Blessed Sacrament central to worship. 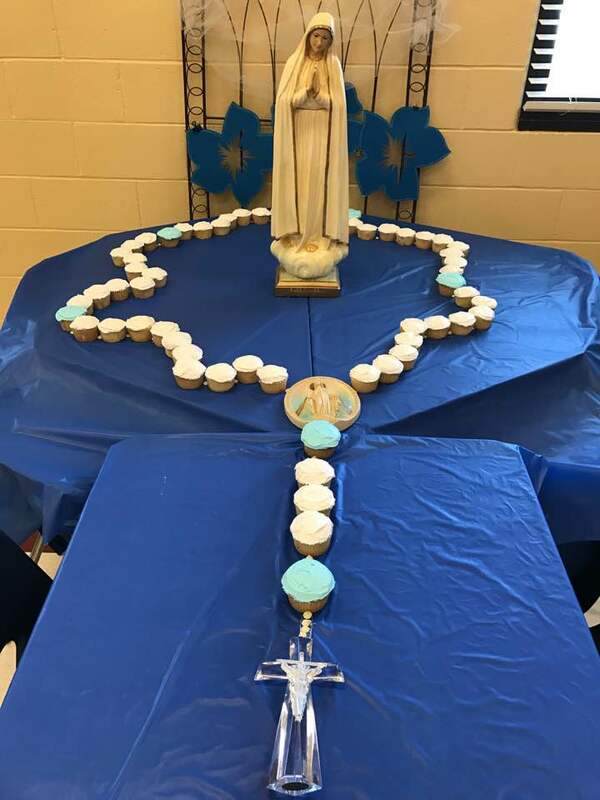 “We restored the stations and also introduced adoration every Friday; then at 3pm, we have the Chaplet of Divine Mercy and Benediction,” Father Nardoianni said. Newly restored and repainted reverential bas relief Stations of the Cross line the nave, alternating with the stained glass. Helping to deepen meditation on each station are the figures, all with individual expressions to ponder and empathize with. Who can’t help but be moved by this depiction of Our Blessed Mother, which reflects her sorrowful heart, the Magdalen’s grief that causes her to cover her face, the care Joseph of Arimathea and Nicodemus express as they lower the Savior from the cross, and the strength of John? Arches of gold frame each station, with reliefs of 13 angels and symbols related to the stations. Angels are showcased elsewhere, too. Beautifully carved cherubs form the corbels decorating the base of columns that seem to support arches for the large dome. The dome is coffered in bright gold, with each individual coffer filled with ornate decoration and outlined in red. At the base of the dome, in each of the four triangular corners, the Evangelists are shown at work on the Gospels. The coffered ceilings in the rest of the arches in the church are also as decorative, but in a muted color. Because this parish church draws visitors and tourists to pray at all hours, the church is open until midnight during the summertime and until 8pm during colder months. Father Nardoianni shared how “people from outside the parish have been very generous to our appeal” for the $3.2-million restoration project. Many donations have come in so far from out of the City on a Hill and the Bay State. Father Nardoianni said the church draws not only Catholics, but non-Catholics, who often ask questions about the faith. On St. Anthony’s feast this June, when he and a fellow friar had just locked the church, a woman, with an infant and her mother in a wheelchair, asked to say a prayer. They prayed fervently in front of the altar, blew a kiss to the saints and gratefully thanked the priests and told them that every time they come to Boston they come to St. Leonard’s. Then they identified themselves as Albanian Muslims. 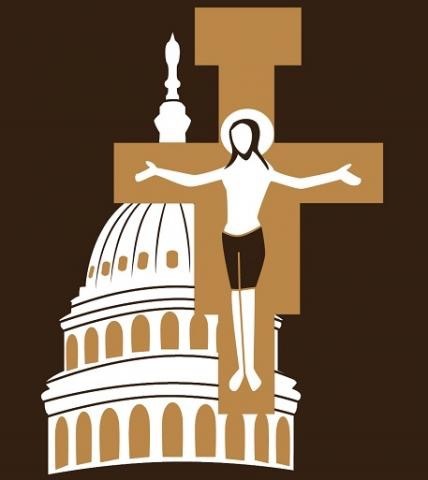 Washington, DC - The Franciscan Action Network (FAN) is inspired by the Gospel of Jesus, and the example of Saints Francis and Clare. FAN is a collective Franciscan voice seeking to transform United States public policy related to peace making, care for creation, poverty, and human rights. "Let us begin again, for up to now we have done little or nothing!" These words of St. Francis of Assisi are a clarion call for us as Franciscans, for our church and church leadership to face the truth that we must begin again, “for up to now we have done little or nothing”, with regard to the situation of the current scandal regarding the misuse of power and authority in this country and in our church. In these recent days we have been faced, once again, with the Pennsylvania grand jury indictments for sexual abuse by members of the Catholic clergy and the failed episcopal oversight. We continue to hear stories of cover-ups, secrecy and the protection of the abusers with little or no regard for those who were and continue to be victimized. The lives of our sisters and brothers have been shattered and broken by a church and by church leaders in whom they trusted, looked up to for their faith development and their very salvation. “Let us begin again, for up to now we have done little or nothing!” As a Catholic community in the United States we have been living with the reality of clerical sexual abuse and failed episcopal oversight for decades. We acknowledge and appreciate the development of many programs and policies for the protection of children and young adults. Yet, in truth “we have done little or nothing” as a Church to address the real and underlying problems of a culture of clericalism that is exclusive of the wholeness of the Body of Christ. Francis of Assisi always saw “power” in service to those to whom he served. This culture of clericalism is a scandal imbued with a deep sense of misguided power that enables the secrecy, the cover-up, and this immoral behavior to go unchecked. “Let us begin again…” As Franciscans we are called to use whatever authority we have to honor, nurture and care for all of God’s creation in all its forms, yet some of our leadership have done little or nothing to protect our children, or as Pope Francis said, "We showed no care for the little ones". We call upon all who have authority in the church, especially our US Bishops, to hold themselves accountable by beginning to genuinely share their authority with competent laity to implement strategies for transparent oversight as well as opportunities for constructive dialogue to address the erosion of our church’s moral and ethical conduct. Together we must commit to clear and measurable policies that will work to bring change for the sake of the gospel to the culture of clericalism within our church. 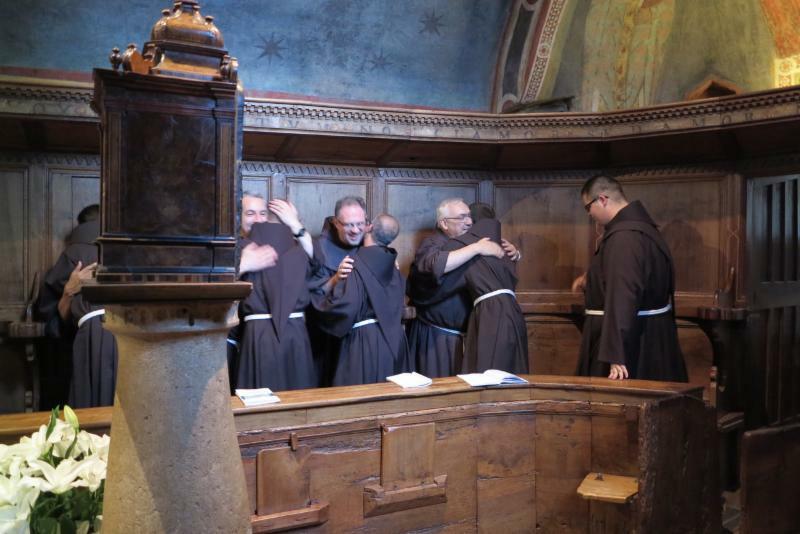 “Let us begin again…” As Franciscans we are called to live a life of gospel penance and ongoing conversion and to witness these virtues and values to everyone we meet. We call upon Pope Francis and members of our church’s hierarchy, especially our U. S. Bishops and priests, as well as all consecrated religious men and women to call for a day of repentance, prayer, and reconciliation acknowledging the sinfulness that has demoralized God’s people and continues to cause pain and suffering in the Body of Christ. “Let us begin again . . .” to build new ways of being Church, recognizing that ministry is rooted in baptism. We must begin again to support the role all the baptized play in leading our church including the vast number of good priests who also suffer for what their ordained brothers have done and failed to do. We must begin again and listen to God’s will so all people may know that they are heard and respected as members of the Body of Christ. Francis of Assisi heard God’s call to “Go, rebuild my Church which is falling into ruin.” We as Franciscans and Catholics must open our ears, our eyes, and our hearts to respond to this call in our lives today. While we pray for deep healing for all those who have suffered, we can only begin to understand that the harm done to so many is irreparable. We urge the leadership of our church to hear Francis’ call to begin again and to rebuild God’s church by committing themselves to authenticity entering into the needed dialogue and pastoral care that calls for total transparency and accountability. Our Province has been invited to a retreat scheduled for October 14-18, 2018 at Mt. Alvernia Retreat Center, Wappingers Falls NY. This retreat will be held by the Capuchin Franciscans of the St. Mary Province. The theme of the retreat is "From Mercy to Mission: Walking with St. Francis into the 21st Century." Retreat director will be Fr. Jack Rathschmidt, O.F.M.Cap. Retreat will be held Sunday evening through Thursday noon. For reservations, contact Fr. Gabriel Massaro: frgabem@aol.com or 845.489.5117. All our friars are invited to this retreat. Güino & Field Office is an Impact Co-working Space that, since May 2017, has partnered with Thrive for the purpose of creating social impact. Since their inception, they have not only given young people with limited economic resources between the ages of 18 and 29 the opportunity to improve their quality of life by learning to develop Augmented Reality, but have also enabled them to sell these services in crowd sourcing platforms from their homes, (they only need to have access to the internet, a smartphone and / or a computer). 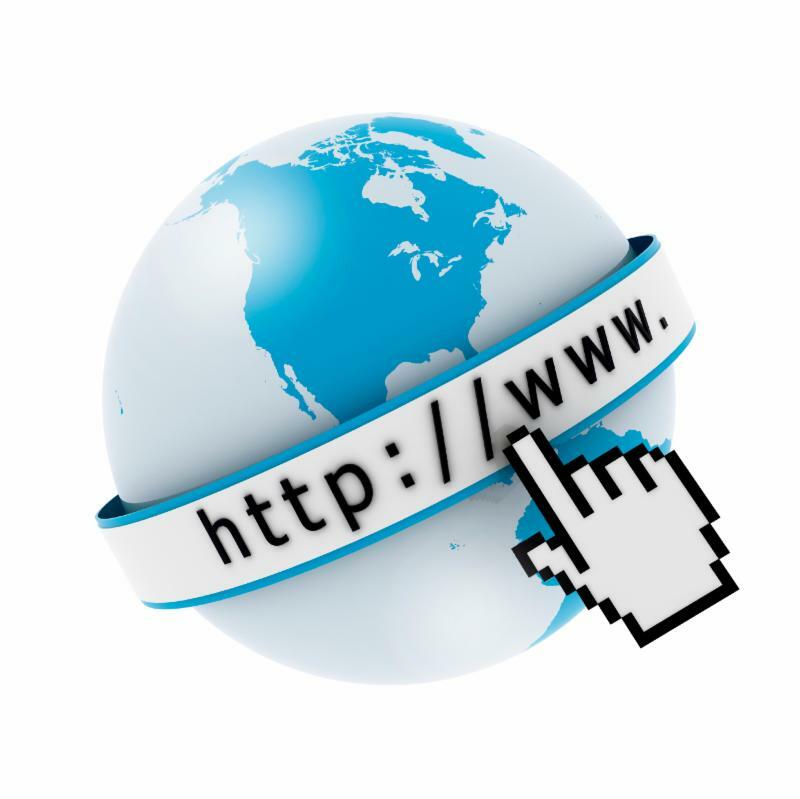 The idea is to give them the opportunity to learn how to generate income through the development of this technology. 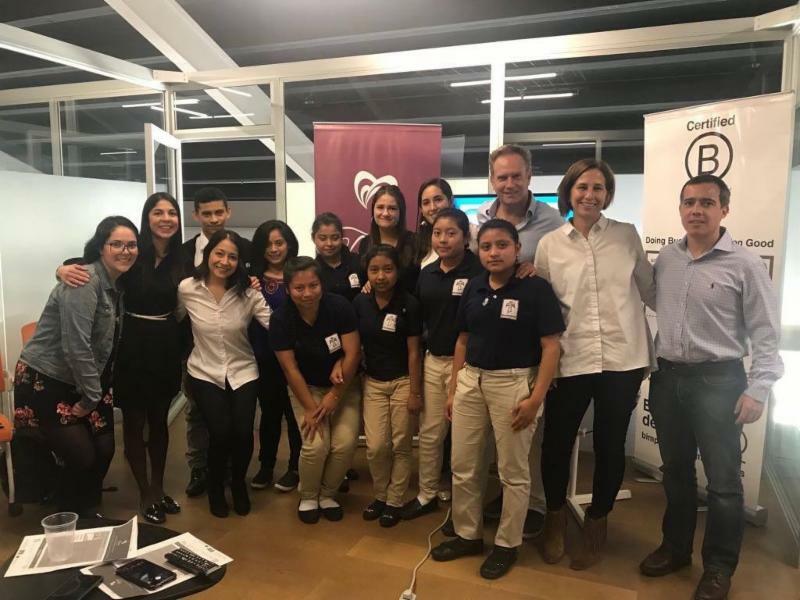 The goal is to allow them to improve their quality of life and motivate them to stay in Guatemala, in their own communities, with their families without the risk of migrating to other cities or to the United States. have offered two Augmented Reality workshops and two "From CSR to Impact Business" seminars to our young women of Quinto Bachillerato. Two of our students participated in Thrive's first workshop for young people called "Learn to Create Augmented Reality" which was held in the Field Office on May 20th and 27th, 2017. The second workshop was held on September 30th and October 7th, 2017, which allowed two other students who received partial scholarships to participate. 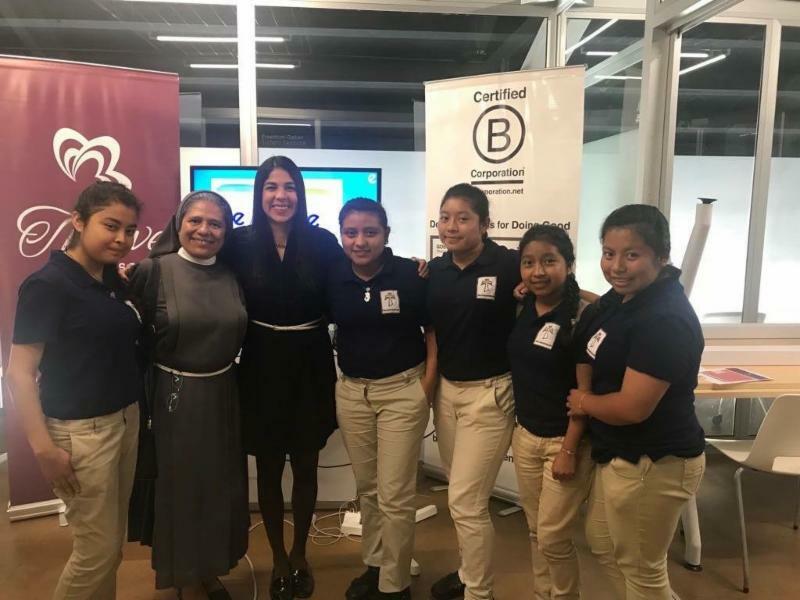 In 2018, Field Office invited Thrive to present the seminars: "From CSR to Impact Businesses" and offered to sponsor the use of the salon, Internet and Café, in exchange for generating social impact, and granting scholarships to young people who need it. Seven full scholarships have been awarded to our girls with the idea that they perpetuate the concept of Impact Entrepreneurship. The hope is that this gives them some ideas before graduating, that they too can become Entrepreneurs of Impact themselves and empower them to solve the problems that they find in their own communities and this generate opportunities to get ahead. The first Seminar "From CSR to Impact Business" held at Field Office in 2018, took place on Tuesday, August 7, 2018. The Second Seminar was held on Tuesday, September 4th, 2018, this time with the participation of five students from Valley of the Angels. 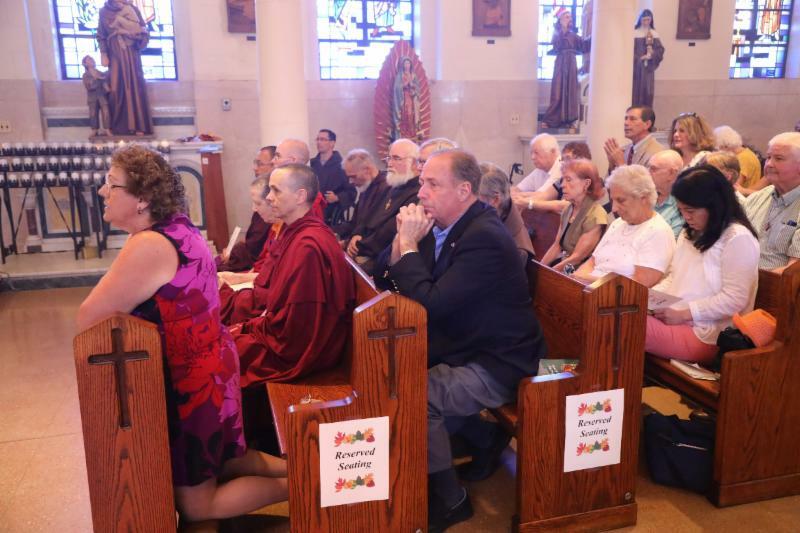 Over two hundred and seventy-five people attend the Liturgy of Thanksgiving at Mt. Alvernia in Wappingers Falls NY to mark the 50 th Anniversary of the Retreat Center on Sunday, September 16, 2018, at 2:00 PM. The Mass was celebrated in the Chapel and followed by an outdoor reception. Friar Robert Campaga, OFM, Minister Provincial, was the main celebrant in a Mass concelebrated by many visiting friars, religious and diocesan priests. Among the congregation were Franciscan, Capuchin, Graymoor and Carmelite Friars. Friar Thomas Garone, OFM, Guardian, and Friar Francis Walter, OFM, Director of Retreats, assisted Friar Robert as principal concelebrants. 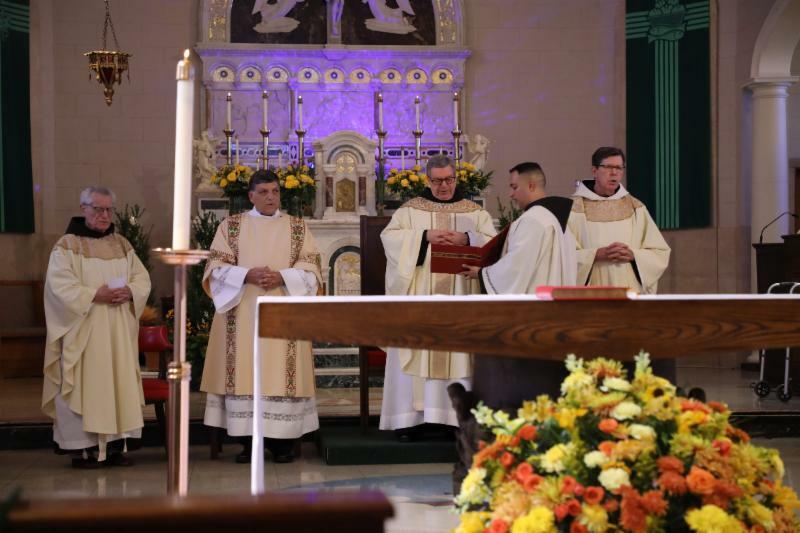 Friar Orlando Ruiz, OFM, Pastor of Our Lady of Peace Church in Brooklyn, served as Master of Ceremonies. In attendance also were many men and women religious, including the local Poor Clares. The homily was given by Friar Romano Almagno, OFM, who organized the celebration. Friar Romano eloquently spoke of the history of Mt. Alvernia, named for Mount LaVerna in Italy, where St. Francis of Assisi received the Stigmata. In 1224, two years before he died, St. Francis went to LaVerna, in what was called by his biographers a period of pessimism and depression. He wasn't happy with the direction his new order was taking. 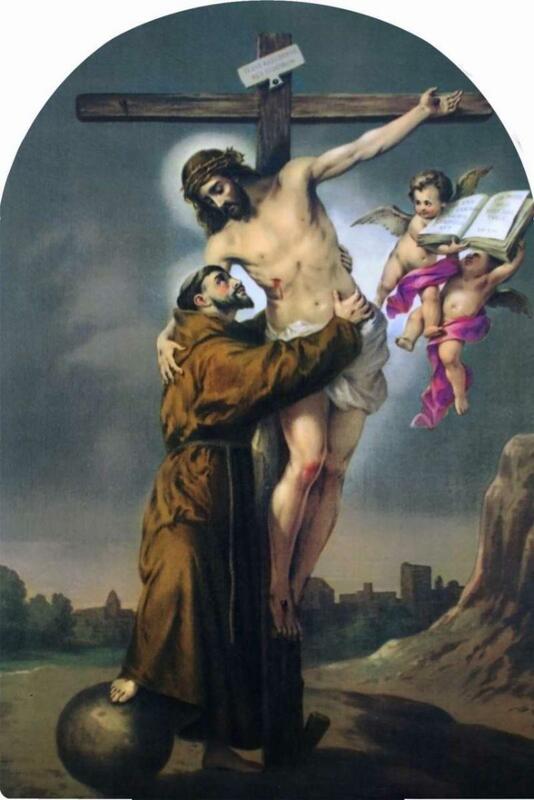 While praying on the mountain, St. Francis received the Sacred Stigmata, the wounds of Jesus on his body. St. Francis, as Friar Romano reminded us, was "marked, sealed, and branded by God." As a result of this, he was filled with consolation and peace, and came down from the mountain a new man. La Verna was, for St. Francis, truly "holy ground." For countless people through these fifty years, Mt. Alvernia has been "holy ground". The friary served the province for many years as the house of theology, but was made a retreat center when the theology students departed in 1968 for St. John Seminary in Boston. Through the efforts of so many people- Franciscan Friars and staff, lay people, volunteers, Mt. Alvernia has become a special place, indeed "holy ground". Friar Romano spoke in particular of the ministry of Friar Thomas More Nicastro, OFM, who founded the retreat center and was Retreat Director for many years, and Friar Roch Ciandella, OFM, who spent twenty-five years at the retreat center as staff member and director. While Friar Thomas saved Mt. Alvernia and made it into a great retreat center, touching the lives of countless people, Friar Roch built on that dream, opening it up not just to Catholics, but to everyone. Friar Romano said that Mt. Alvernia has become for countless people an icon of Mt. LaVerna- what LaVerna was for St. Francis, Mt. Alvernia has been as a source of refuge, strength, and renewal for many others. Among those coming to Mt. Alvernia with their joys and sorrows, their hopes, and dreams, and have been blessed with healing, peace, encouragement, and new direction are Anglican priests, Japanese Catholics, Russian Orthodox, Uniate Eastern Rites, Korean Protestants, CCD teachers, deacons, divorced, hospital and prison chaplains, married and single persons, gay men and women, millennials, Confirmation candidates and many more. A great witness to this were the Buddhist monks sitting the front pew of the chapel clad in their saffron robes. Mt. Alvernia continues to thrive as a place of rest and prayer, of questions and instruction, of mercy and reconciliation. "We are standing on holy ground, and I know that there are angels gathered round. "